Who wouldn’t love to win lots of money with very little effort? Many people believe that gambling provides such an opportunity, but in reality it just gives people that illusion. Many people end up losing their money when they gamble. To win back their lost money they play again, and the process repeats. This ultimately leads to what is known as problem gambling. Problem gambling or gambling addiction is the uncontrollable urge to continue gambling regardless of the negative consequences. When problem gambling crosses a certain limit and becomes extreme it is diagnosed as clinical pathological gambling. But the question is what causes this problem gambling in the first place? Gambling is always available just around the corner. There are various forms of gambling available. Gambling does not necessarily have to be playing slots or cards at the casino. When you buy a lottery ticket or even making a simple with your friend you are gambling. Two of the major reasons why people get addicted to gambling are for the need of an emotional high and desperation of money. Many people feel an emotional high when taking huge risks and they continue placing bets and taking chances to experience that high. This ultimately results in the person becoming addicted to gambling. On the other hand, some people begin gambling in the hopes of winning a large sum of money which they require to solve their financial problems. In such cases, the person gets stuck in a continuous cycle of losing money and coming back again and again to recover their losses. 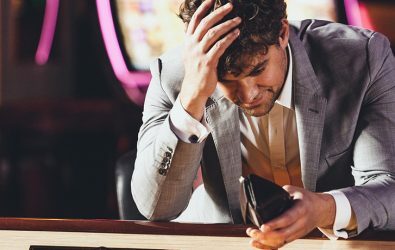 Other reasons of problem gambling include the experience the rich lifestyle of a successful gambler and the dream of making it to the mainstream gambling stage. So now we know what problem gambling is and why do people do it. But how do you realise that this problem is affecting you? People often compare gambling addiction with other substance addictions. Doctors say there are many similarities between addiction to gambling and other addictions, especially in their symptoms. For example, feeling the need to be secretive about your gambling is a common symptom. If you have been hiding your gambling habits from your family and friends you might have an addiction to gambling. Another symptom common to all addictions is the need to try it one more time or having difficulty in quitting it. When you have difficulty in controlling your amount of gambling and you gamble with money that you cannot afford to lose, it is highly likely that problem gambling is affecting you. The extreme level of gambling causes emotional symptoms such as depression, anxiety and having suicidal thoughts. These, in turn, affect your physical health in the form of insomnia, weight loss etc. So if you are concerned that you or someone around you could be affected by problem gambling you should keep an eye out for these symptoms. In addition to all this gambling also has negative effects on family relationships and social life. Gamblers tend to spend lesser time with their friends and family while spending more time on gambling. These lead to emotional distances between family members which cause an increase in family arguments. In worst cases, these can lead up to divorces causing the relationship to end. This, in turn, tends to decline a gambler’s interest in social life and real relationships leading to social isolation. Gamblers are also more prone to developing a substance misuse problem and engaging in other criminal activities. Recovering from a gambling addiction is just as difficult as recovering from any other addiction. Most gamblers lose not only their money but also their family, their interests and their entire social life due to gambling. Gambling is the only thing they have left in their lives. Hence giving it up will require a huge amount of willpower and determination. The most important change to bring about is to change your behaviour. Your entire lifestyle would need to change if you want to overcome this problem. You will need to shift your mindset from gambling and occupy your time with other positive activities. One of the best choices is engaging in sports. In addition to occupying your time it also has the added advantages of improving your physical health, learning teamwork, meeting new people and making new friends. Activities that will help you shift your focus on gambling also include gardening, camping, volunteering etc. Some other solutions to overcome gambling include self-exclusion and using blocking software. Self-exclusion is when you ask the gambling operator to prevent you from allowing for gambling for a certain amount of time. The extent of this time can be anywhere from 6 months to 5 years. Places to use self-exclusion are your regular gambling spots and any other places to gamble that are near you. On the other hand, many gamblers do not gamble in real brick and mortar casinos, rather they choose to gamble online. For these people, there is a variety of blocking software available that will block all gambling websites so that they cannot get access to them anymore. Once you accept that you are willing to change and begin the process to eliminate gambling from your life there are two very important things you need to do first. Firstly, contact your friends and family and let them know about your current situation. You might have lost contact with them due to your gambling problem but now is the time to make amends. With time they will become your biggest strength against gambling. The second very important thing to do is get a control over your finances. Your gambling habits might have left you deep in debt but you need to begin tackling your financial problems. At first, it will seem very scary and frightening but the fact is you cannot run away from them. Rather face them and begin making plans on how to solve them. Keeping all these points in mind hopefully, you will be able to overcome your addiction to gambling and lead a much happier and healthier life.